This is the deal. On Friday I am responsible for the dinner and the wine. I can grill, I can roast, stir-fry… re-heat. It’s my call. Sometimes, take-out, or I can pick out a restaurant. Killing a raccoon on Swamp Road in Newtown doesn’t count. And of course, an appropriate wine. More often then not, grilling is my métier. Our Weber is in use 12 months of the year, and I grill everything… including a raccoon if I bag one. But after awhile grilling does get boring. How often can you enjoy a 2” thick bone-in rib-eye? It would be like opening a bottle of Beaucastel all the time. The special qualities of both food and wine would vanish into the ordinary. I begin to worry about what I am going to prepare on Friday on Tuesday. Worrying is also my métier. And too often the decision is not reached ’til 11:45 on Friday morning, somewhere between lap 65 and 100 of the LA Fitness pool. Tuesday just past, the worrying kicked into high gear. I make my customary mental review: rib-eye? No! Baby backs? Nope. New Zealand lamb chops? Last week. Chicken parm? Not in the mood. Lobster tails? Hmmmmm. I think I am on the right scent! OK… I found the inspiration: Cioppino!! Don’t ask me how my mind works. Cioppino? I can’t remember when I had it last… or even if I had it before! But I knew of the dish. An Italian version of Bouillabaisse? And I love Bouillabaisse! But maybe I would be out of my depth preparation-and-cooking-skill wise? Certainly it would be more involved than throwing a marinated flank steak on the grill! Thursday. Create a shopping list. The wine? I could do this in my sleep! Red or white could work. A Dolcetto D’Alba would be good. So would a Cru Beaujolais. Or a Portuguese blend. But I’m going white… mineral driven, non-oaked. Something from Alsace… either a Pinot Gris or a Pinot Blanc. Or, something from Alto-Adige in Italy. Or, Spain. The whites from Galicia, from Spain’s Atlantic Coast, are stunning. In particular the Albariño’s from the Rias Baixas are meant for seafood! Badda-bing, Badda-boom! Founded in 1904, Palacio de Fefiñanes is housed inside a spectacular baronial palace which sits on the lovely main square of coastal Cambados. The facility was built in 1647 by Viscount of Fefiñanes Gonzalo Sarmiento Valladares (1583-1659) and is currently owned by Juan Gil Careaga. Palacio de Fefiñanes was the first producer to bottle wine under the D.O. Rías Baixas denomination. Vineyards in the Rias Baixas region are impacted by the wind due to the proximity of the Atlantic Ocean . The climate provides acidity and freshness to the wine. Lovely balance, crisp fruit flavor spiked with minerals of wet stone. Finishing clean and soft. n.b. 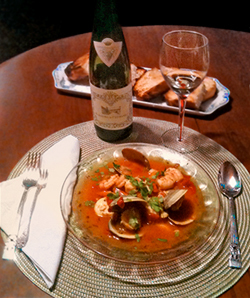 Cioppino is not an Italian dish. Its home port is San Francisco. It goes back to the late 1800s and is the ad hoc creation of the Portuguese and Italian fishermen from North Beach. Not technically Italian; but certainly the spirit of the dish is Mediterranean. I opted to use an Italian bread which I cut into rather thick slices. I brushed both sides of the bread with a garlic infused olive oil, and toasted the bread on the grill. OK, I admit it: I am a sucker for grill marks! I cut the slices of toasted bread in half, perfect “dunking-in-the-cioppino” size! Next week? Raccoon du Jour… maybe!